9 Best Places to Visit in Georgia (Europe) That You Definitely Can't Miss! I’m an American who has traveled to 65+ countries across six continents around the world and have had some pretty incredible experiences along the way (you can check out my favorite photos of the 43 countries I visited last year here). I love helping other travelers out so follow along for tips, guides, and more! 9 Best Places to Visit in Georgia (Europe) That You Definitely Can’t Miss! Looking for the best places to visit in Georgia (the country in Europe)? Well, you’ve come to the right place, so get your bucket-list ready! There are so many awesome things to do in Georgia that one can easily find yourself lost in this stunning Caucasian country for weeks or longer. It’s no wonder that the country of Georgia has exploded onto the tourist scene over the past few years. With over 65 countries across the world under my belt, Georgia remains at the top of my list as my absolute favorite country in the world. The country of Georgia offers everything a traveler could want: affordable prices, a welcoming culture, excellent and cheap transportation options, incredible mountains, seaside resorts, vibrant city life, and delicious food and drink. There is a lot to choose from in this incredible country, but you won’t want to miss these 9 unique places to visit in Georgia Europe. And if you are headed to the country of Georgia, be sure to check out my Georgia Travel Guide for more details on the best places to visit in Georgia, things to do do in the country, sample Georgia itineraries, and more! You also might like this list of 10 Amazing Things to do in Georgia Europe. Batumi reminds me of what would happen if you mixed Singapore with Atlantic City, shrunk it down ten sizes and plopped in onto the Black Sea’s pebble beaches. Batumi, Georgia offers modern architecture (Donald Trump once had plans to build a skyscraper here), an enormous and gorgeous botanical garden, and access to the pebble beaches of the Black Sea. In summer, Russian, Georgian, and international visitors descend on the city, with its beaches crowded by day and its nightclubs throbbing through the night. 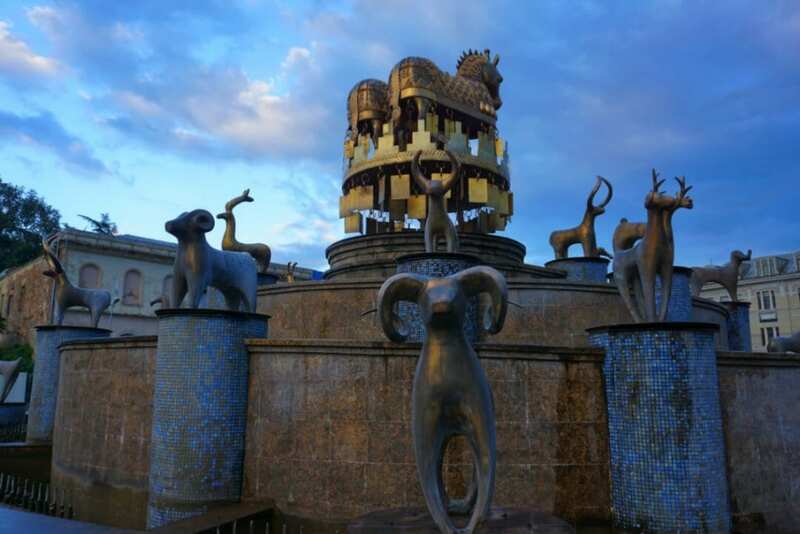 Batumi is definitely one of the best cities to visit in Georgia. 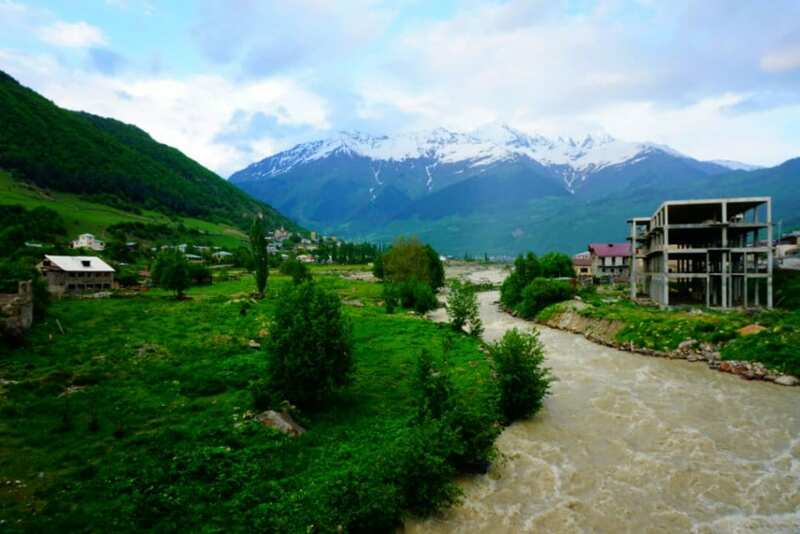 Mestia is the main town in the mountainous region of Svaneti. Svaneti isn’t easy to get to (unless you can snag one of the few flights from Tbilisi to Mestia), but it’s well worth a visit to this stunning but isolated mountain region. There you’ll find a unique but fierce culture that has managed to ward off invaders ranging from the Mongols to the Persians to the Ottomans. With the government of Georgia heavily promoting tourism to Svaneti, Mestia is quickly taking off as one of the top tourist destinations in the country of Georgia. But, while the town now offers higher-end hotels and a airport terminal that looks like it’s from the future, it still retains its centuries-old charm. While I always encourage people to make their own travel path, and don’t usually believe in such things as “must see” places,” I really think Svaneti is one of the most incredible places to visit not just in Georgia but in all of Europe. Svaneti, Georgia is so incredible and beautiful (it’s my favorite place in my favorite country in the world) that it warrants two entries on this list. Ushguli is a tiny collection of villages high in the Caucasian mountains. You can only access it via a single dirt road from Mestia, or via a four day trek on foot, but it’s well worth the journey. Dozens of ancient watchtowers guard the entrance to this surreal area, which is hemmed in by jagged and imposing mountains. It’s still possible to spend a night staying with a Svan family here for a small fee, where you’ll likely be treated to a delicious dinner and copious wine while a fire crackles in the background. I generally shy away from calling anything a “Must See,” but I’ll make an exception here: if you’re going all the way to Georgia, you should make the trip to Ushguli. Tbilisi is definitely the top city to visit in Georgia. Almost every tourist traveling to Georgia will make a visit to Tbilisi at some point, and the city, despite being so popular with the traveler crowd, won’t disappoint. Tblisi contains a charming old town situated on a dramatic cliff-side, which mamkes for some awesome views. 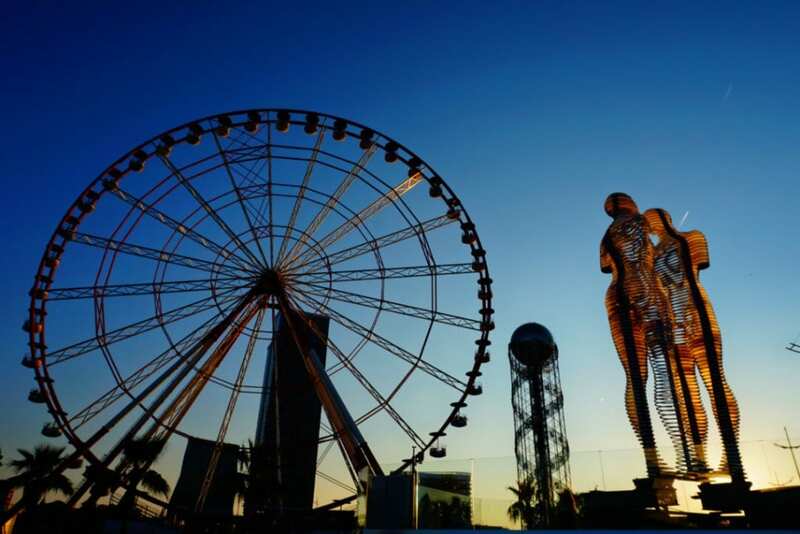 It offers first-class dining options at cut-rate prices (at least by European standards), vibrant nightlife, affordable accommodation, and easy access to day trips through large parts of the country. No wonder Tbilisi remains the most popular and best city to visit in Georgia for most travelers. Click here to check out the many tours and trips you can do to places around Georgia from Tbilisi. 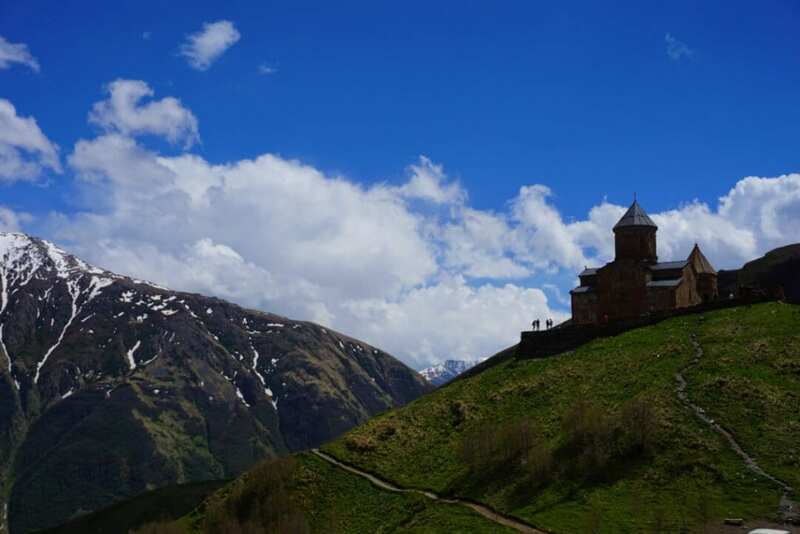 Perhaps the most recognizable icon of Georgia, the Gergeti Trinity Church stands guard over the Kazbegi region from its perch on a hillside just under Mount Kazbegi. You can access Kazbegi as part of a day trip from Tbilisi, or you can opt to stay overnight in Stepantsminda town, allowing you get up early to beat the crowds and catch the morning sun glistening off Trinity Church. You’re sure to work up a hunger during the climb, so be sure to stop over in Stepantsmida on your way back for some delicious Georgian khachapuri to fill you up. 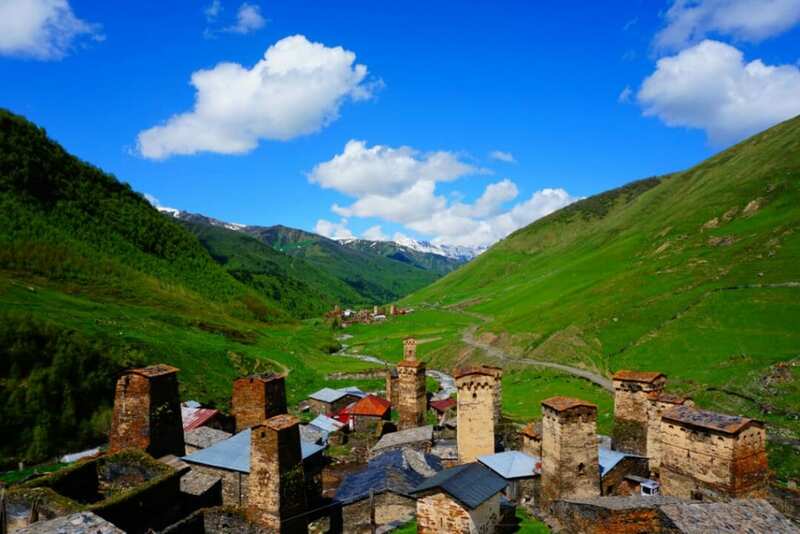 Click here to see pricing for tours to Kazbegi. Georgians love their wine. Just about every family you’ll meet has some fermenting in their basement. But Georgia also has you covered with high-end vino. In fact, Georgia’s Kakheti region is quickly becoming famous for serving up some of best — and most affordable — wine in the world. 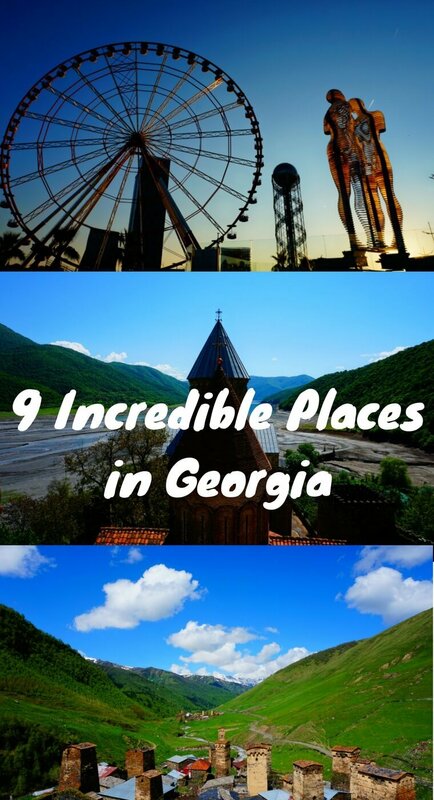 Not to mention, it’s one of the most beautiful places to visit in Georgia in its own right. You can tour Kakheti’s many wineries as part of one of the many day trips on offer in Tbilisi’s Old Town, or you can opt to soak in the region’s gorgeous landscapes by spending a few nights exploring the many villages and towns in this large region. If you have time, a trip to the David Gareja monastery complex in the south is also one of the more popular places to visit in Georgia Europe. Click here to see pricing for wine tours of Kakheti. Georgia is unusual in that it technically has two capital cities, with its legislature sitting the central city of Kutaisi and the rest of the government in Tbilisi. The town of Kutaisi is much smaller than Tbilisi, but is still charming and offers enough to do – monasteries, churches, and restaurants – to warrant a night or two. Kutaisi also may fit into your Georgia itinerary if you arrive or depart on one of the increasing number of cheap international flights avaialble from mainland Europe. This one is going to be a bit controversial as an inclusion on a list of places to visit in Georgia Europe. 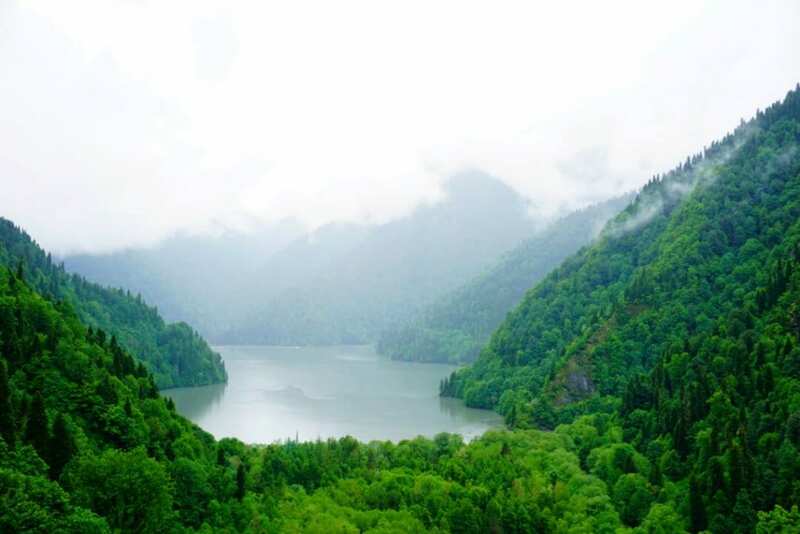 That’s because Lake Ritsa is located in Abkhazia – an area that is is a self-proclaimed independent nation whose borders are largely controlled by Russia. But Abkhazia is widely considered by the international community to be a part of Georgia. A visit to Abkhazia isn’t for everyone and is potentially even dangerous. But, politics aside, intrepid travelers to the former Soviet retreat at Lake Ritsa (Stalin himself used to have a home here) will be rewarded with access to incredible nature juxtaposed against hauntingly abandoned buildings. Before going, check out my full guide to what to do in Abkhazia. About 70 kilometers north of Tbilisi lies the unbelievable Ananuri castle complex – a can’t miss destination in Georgia for many tourists. The 17th-century structure has survived numerous attacks over the centuries, and stands in stunning contrast to the Aragvi River, which it overlooks. You can visit several different churches within the small complex, or climb one of the watchtowers for a unique view of the surroundings. Ananuri can easily be explored as a day trip from Tbilisi, and is often combined with visits to Kazbegi, allowing you to check off several of the best places to visit in Georgia in a single day. 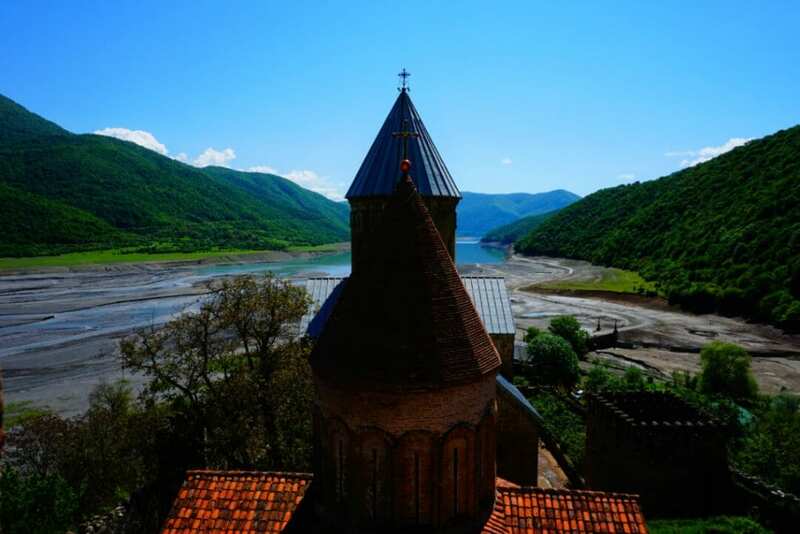 Click here to price out a day trip to Ananuri and Kazbegi from Tbilisi. Eager to Explore The Best Places to Visit in Georgia Europe? Then check out my Georgia Travel Itinerary and Guide for detailed information on when to visit Georgia, where to go, and possible itineraries for the amazing country of Georgia. You also definitely don’t want to miss my list of 10 Things to do in Georgia Europe! And, as always, feel free to ask questions – or let me know your thoughts – in the comments! What do you think are the best places to visit in Georgia? 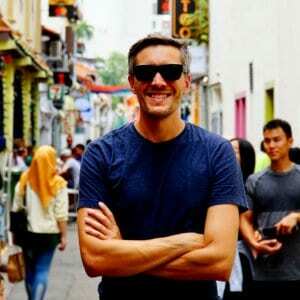 Nate Hake has traveled to 65+ countries across six continents around the world and blogs about his travels at TravelLemming.com. He is from Denver, Colorado, recently concluded a six month stint living in Mexico, and is now currently traveling in Thailand. Hey Nate, that’s a great list! Thanks Naddya! Hope you get the chance to make it there. Georgia is such a great destination. Good information, Nate. Keep it up. I am visiting Georgia for 8 days and would like to cover as much as possible. I plan to self drive around the country. Can you tell what would be the ideal places to cover given the duration in hand? I land and take off from Tbilisi. Hey Pravin! That sounds amazing. I would suggest doing a loop from Tbilisi over to Batumi for a day, up to Mestia and Ushguli (the latter of which your car probably won’t handle so you’ll need to get a ride in a 4×4), then back down for a long drive over to Kazbegi or Kakheti before returning to Tbilisi. That’s a little busy for an itinerary, but it takes in the highlights. And there are a lot of different options – that’s not the only one! Hey Julie! That’s so exciting. I remember my first time in Europe – it’s such an incredible experience. Georgia is beautiful and you should definitely go. It is a bit on the far side of the continent, which means you’ll probably need to catch a plane to get there. 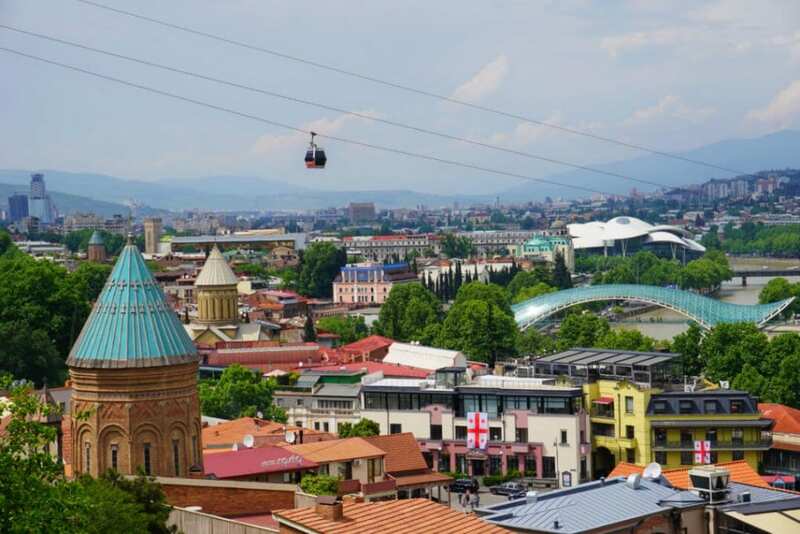 There are direct flights to Tbilisi from Warsaw (LOT) and Munich (Lufthansa), or you can connect through Moscow or Istanbul on a bunch of flights. Wizz Air also offers a bunch of flights around Europe from Kutaisi! 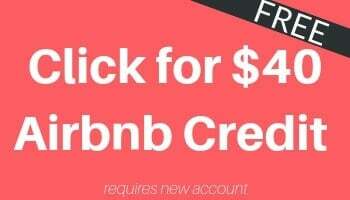 Let me know if I can be of help as you get closer to your trip. And I hope you enjoy beautiful Georgia! I would like to send my son for his university’s study in Georgia. Is there any one can guide me and support or give any information in this regard? I’m not familiar with the university process in Georgia. It is a beautiful country and I think he would have a great time studying there. I’m sorry I don’t have more specific information though!